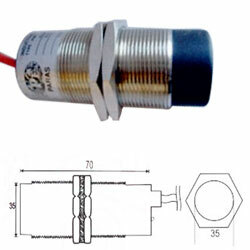 Inductive proximity switches (barrel round) DC type M-22X50 NFM(NO+NC) are engineered as per international industrial standard and using best available techniques. These are designed with 4 core PVC and PU flexible cables and LED position indicator. 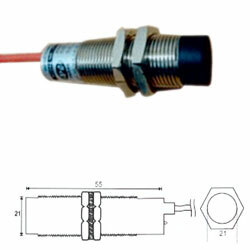 Inductive proximity switches DC type are available in sizes from 4mm to 80mm diameter. These are mainly PNP and NPN type having Flush and Non Flush Mounting. These have NO / NC and NO+NC output logic. MAX. LOAD CURRENT 300 mAmp. NO LOAD CURRENT >10 mAmp. SWITCHING FREQUENCY 225 Hz max. H.V. TEST 1.5 KV for 1 Sec. 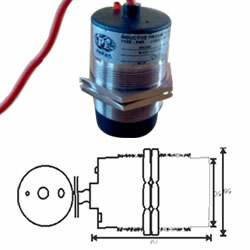 Application: Inductive Proximity Switches are used to sense the position of metals (any type). Some possible applications are shown in the figures below. 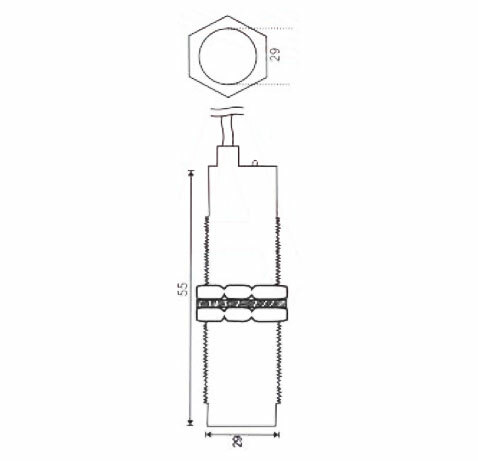 Inductive proximity switches (barrel round) DC type M-30X50 NFM are engineered using best quality components and following global industrial standard. These are engineered with CE approval. 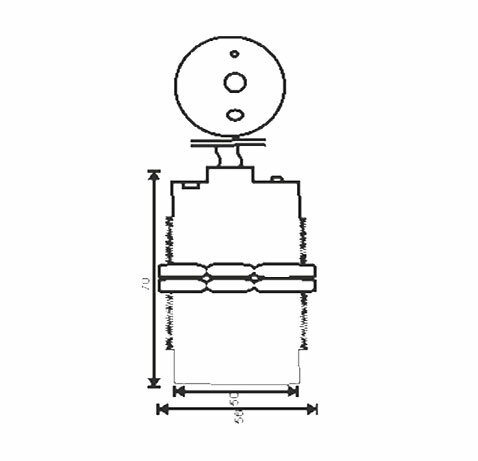 Inductive proximity switches DC type are available in sizes from 4mm to 80mm diameter. These are mainly PNP and NPN type having Flush and Non Flush Mounting. These have NO / NC and NO+NC output logic. SWITCHING FREQUENCY 150 Hz max. 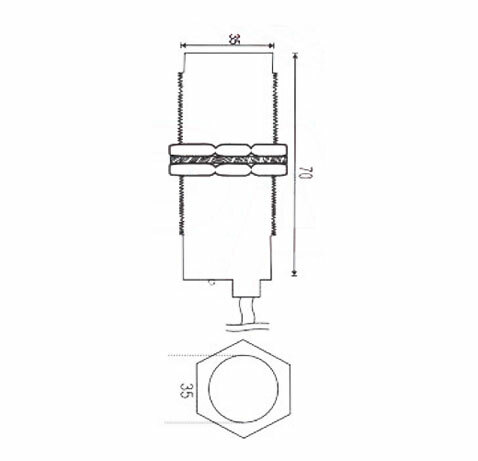 Inductive proximity switches (barrel round) DC type M-36X65 NFM are engineered as per international industrial standard and by implementing best available techniques. These have 150 Hz switching frequency and 300mAmp maximum load current. 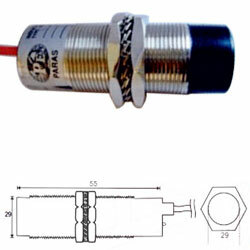 Inductive proximity switches DC type are available in sizes from 4mm to 80mm diameter. These are mainly PNP and NPN type having Flush and Non Flush Mounting. These have NO / NC and NO+NC output logic. Inductive proximity switches (barrel round) DC type M-50X65 NFM are engineered under the strict supervision of experienced quality controllers. These have non flush mounting. 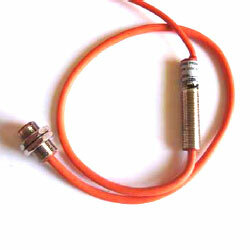 Inductive proximity switches DC type are available in sizes from 4mm to 80mm diameter. These are mainly PNP and NPN type having Flush and Non Flush Mounting. These have NO / NC and NO+NC output logic. SWITCHING FREQUENCY 75 Hz max. Inductive proximity switches barrel round DC type are engineered precisely to detect the metal objects without touching them. These have various industrial uses which may include light-duty packaging applications and automotive welding applications. These inductive proximity switches barrel round DC type have high resistivity against current and can bear up to 300 mAmp of maximum load current. It is technologically advanced range with nickel plated brass tube enclosure and has 3 cores PVC and PU coated cable which is flexible to provide easy movement. NO LOAD CURRENT >10.0 mAmp.